The Hall Group is a growth-oriented organization empowering its employees to fulfill their potential so that Bush-Whacker® is recognized for excellence by its business partners. Bush-Whacker® was created out of the need for a heavy-duty brush hog mower that state, county, and city governments could depend on day in and day out to mow the miles and miles of right-away. For the past 40 years highway departments have relied on Bush-Whacker® products and over time the general consumer has expressed a need for a range of American made products that meet their need for high performance and reliable agricultural equipment. 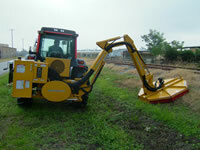 Bush-Whacker® has been very proud to fill that need and develop new innovative products to give you the cutting edge. Bush-Whacker is an elite manufacture of rotary mowers, also called drum mowers, which have a rapidly rotating bar, or disks mounted on a bar, with sharpened edges that cut the crop. When these mowers are tractor-mounted they are easily capable of mowing grass at up to 20 miles per hour (32 km/h) in good conditions. In rough cutting conditions the blades attached to the disks are swivelled to absorb blows from obstructions. Mostly these are rear-mounted units and in some countries are called scrub cutters. Self-powered mowers of this type are used for rougher grass in gardening and other land maintenance.